While this plan moves the Division in some important new directions, it is not meant to be a comprehensive catalog of all DLD activities. Rather this plan concentrates on identifying the strategic focus areas our services were built on in the past and will be built on in the fu-ture. And within these focus areas we identify the specific objectives we intend to reach in the next few years. Our overall goal is to adapt thoughtfully to the emerging challenges and opportunities that we face as a state agency and find meaningful ways of helping libraries provide innovative services that meet changing community needs. Library professionals across the state will have access to DLD resources and services regardless of location, time restrictions, job status, experience, or position. CT Libraries will have the tools and resources to develop into start-up incubators. constantly evolving; the way the Division delivers resources and services must transcend the traditional methods. Objective 1: Build a flexible digital portal that meets the needs of the library and greater CT community. Objective 2: Support a diverse range of digital initiatives that empower CT libraries as incubators for creativity. Objective 3: Foster enthusiasm and support for the platform through meaningful engagement and consistent communication. The platform sparks a continuous flow of ideas for new services and new ways of delivering services. A process is in place to incorporate these new ideas in the platform’s development plans. enhanced by technology to foster more dynamic training, brainstorming and creativity among CT librarians who will feel empowered to engage their communities. Objective 1: Be the incubator for knowledge and creativity through interactive learning. Objective 2: Recruit for a dynamic catalog of “experts”—home grown and beyond—with diverse backgrounds and unique skill sets to meet the knowledge requirements of the library community. Objective 3: Be accessible; deliver education in a variety of formats and platforms to engage the broader CT library community. Library staff at all organizational levels and with diverse learning styles demonstrate a measurable increase in knowledge and understanding of library related facts, skills and issues. Content of DLD training meets the professional development needs of the library community and is developed based on their feedback. CT library community turns to DLD for inspiration, knowledge, and resources that improve their skills and enhance job performance. Early Literacy – CT families will have the knowledge and support needed to foster early literacy skills in their young children. Children will start school with early literacy skills necessary for grade-level success. Basic Literacy –CT residents’ literacy rates will be raised, fostering a trained and skilled workforce that contributes to the economic growth and development of com-munities and the state as a whole. Digital Literacy –CT residents will be empowered to access information electroni-cally, use and share information, create original content, evaluate the value of infor-mation, and make informed decisions to fully participate in a digital society. Financial Literacy –CT residents will have the knowledge and skill to become in-formed consumers, grow and manage wealth, and foster innovation and entrepreneur-ship, which will contribute to the economic development of their community and the state as a whole. Health Literacy – CT residents will be able to manage their well-being and will be empowered to become effective partners with their healthcare providers. Civic/Social Literacy – CT citizens will have the knowledge and skills they need to improve their lives, participate and contribute effectively in their community, and con-nect with one another through dialogue. Legal Literacy – CT residents will have increased access to justice and have the knowledge and skills they need to effectively navigate the legal services and resources available. Objective 1: Create an interactive toolkit specific to each literacy, with enhanced links to critical resources, and integrated into all aspects of consulting, training, and outreach activities. Objective 2: Continue to develop strategic life learning partnerships to foster empowerment, independence, and self sufficiency in each of the seven literacies. Objective 3: With strategic partners, develop innovative and comprehensive learning modules to fully engage DLD staff and CT librarians in the seven literacies. All public and school librarians are aware of the literacy toolkits and learning modules available from DLD. Library staff has the training and tools to assess their own understanding of the seven literacies and have access to resources to improve their knowledge. Libraries are able to offer their patrons resources and services in any or all of the seven literacies using DLD toolkits. both physical and virtual; it establishes personal connections, provides an anchor to the library community, creates a connecting location, and engages librarians to share, network, create, and so much more. Objective 1: Develop a plan for a model interactive, flexible, incubator space to engage the library community in learning, collaboration, and creating activities. Objective 2: Focus existing and future space on services – consulting, training, digital creator labs, demonstration areas and programming. Objective 3: Space as a platform to foster digital initiatives as well as a mobile space to engage the library community anywhere in the state. DLD will develop implement a mobile lab with “try-it-out” maker concepts, new technology, and trainers to visit and engage librarians throughout the state. DLD will have a modern, well-equipped, central location from which to offer state-of-the-art professional development, consulting, and digital information services. DLD space will serve as a model for CT libraries and will inspire construction grant projects that design library space using these same principles. training and resources are critical to ensuring the long- term sustainability of all libraries. Objective 1: Develop the tools – resources, training, best practices, model programs—for libraries to “tell their story”. Objective 2: Engage in ongoing outreach and consulting to empower the library community to feel confident in telling their story. Objective 3: Foster strategic partnerships to leverage libraries as essential organizations in the community. Connecticut librarians are comfortable and confident in explaining the significance and importance of their libraries to their community. Libraries will tell their stories with statistics using tools provided by DLD. Libraries will be sought out by community organizations and municipal departments and agencies as partners to meet and align services with community needs. critical to all of the strategic focus areas; should be meaningful and consistent. Objective 1: Develop a unified, clear message about who we are and what we do. Objective 2: Deliver the message through personalized consulting with each DLD staff being responsible for engaging a specific regional area. Objective 3: Continually evaluate and refine the message to ensure that DLD is maximizing PEOPLE, PLACE and PLATFORM to inform, engage and empower the CT library community. Librarians are well-informed of the resources and services available to them and the various platforms which they can access these resources. Librarians are familiar with DLD staff and are fully aware of their expertise, skill sets and consulting areas. Librarians feel comfortable and confident in their ability to contact DLD staff for advice, consulting, training, or other assistance as needed. Present a unified social media voice, not just to pass information along but to put information in context and offer further assistance. The goal of the Copyright Information Center is to provide Cornell faculty, staff, and students with Cornell-specific and general information about copyright. The Website serves as an information clearinghouse and contains Cornell policies, general information, reference materials, and information on the University’s copyright awareness and education programs. B y empowering individuals, Europe’s 65,000 public libraries build stronger communities and change lives. The goal of the Public Libraries 2020 programme (PL2020) is to raise awareness about the importance of public libraries as modern learning hubs close to citizens and (potential) learners. Public libraries have been expanding their role in local communities enormously over the last decades – many of them now help people develop their digital skills, advance or acquire other skills (such as literacy) through various lifelong learning opportunities and offer a neutral and trusted space for people to create, learn, and connect. The PL2020 programme is run by The Reading & Writing Foundation (in Dutch: Stichting Lezen & Schrijven), which was founded in 2004 by H.R.H. Princess Laurentien of the Netherlands with the aim of structurally solving illiteracy in the Netherlands. Over the course of the years, The Reading & Writing Foundation has also started working towards this goal internationally. We bring literacy problems to the attention of both the general public and politicians, as well as offering nationwide support to hundreds of municipalities, institutions, companies, teachers and volunteers in the education sector. Report Extract: “American libraries are buffeted by cross currents. Citizens believe that libraries are important community institutions and profess interest in libraries offering a range of new program possibilities. Yet, even as the public expresses interest in additional library services, there are signs that the share of Americans visiting libraries has edged downward over the past three years, although it is too soon to know whether or not this is a trend.The data paint a complex portrait of disruption and aspiration. There are relatively active constituents who hope libraries will maintain valuable legacy functions such as lending printed books. At the same time, there are those who support the idea that libraries should adapt to a world where more and more information lives in digital form, accessible anytime and anywhere. The big questions: What should happen to the books? What should happen to the buildings? Two key questions highlight the challenge library leaders face. First, what should libraries do with their books? Some 30% of those ages 16 and over think libraries should “definitely” move some print books and stacks out of public locations to free up more space for such things as tech centers, reading rooms, meeting rooms and cultural events; 40% say libraries should “maybe” do that; and 25% say libraries should “definitely not” do that. Since 2012, there has been an uptick of 10 percentage points in those saying libraries should “definitely” move some books and stacks (20% v. 30%) and an 11-point downtick in those saying that should “definitely not” be done (36% v. 25%). The second key question is: Should bricks-and-mortar libraries have a smaller physical footprint in their communities? A majority do not think so. Nearly two-thirds (64%) of those ages 16 and over say libraries should “definitely” have more comfortable spaces for reading, working and relaxing. This represents a modest increase in this view since 2012, and it suggests that libraries still occupy a prominent spot in people’s minds as a place to go. For those who have visited a public library in the previous 12 months, traditional activities such as checking out a book or getting help from a librarian are somewhat on the decline. 66% of those who visited a library in the past 12 months say they borrowed print books, compared with 73% who did in 2012. 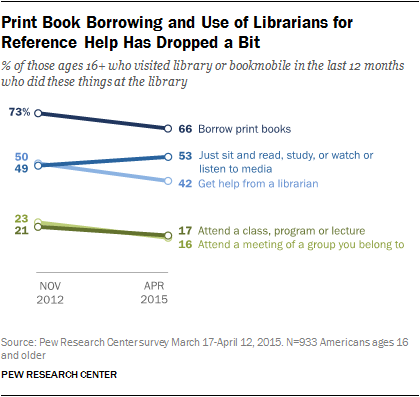 42% of recent library users have asked the librarian for help, down from 50% in 2012. At the same time, the number of library users who value the library as a place to simply sit and read, study or access media has increased a little. Some 53% of those who used a library in the past 12 months used it as a reading or studying locale, up from 49% who said this in 2012. Some 16% of library users in the past year have attended a meeting there, down somewhat from 23% who did this in 2012. Borrowing printed books is more likely to be the province of the well-off and well-educated: 80% of the library-using college graduates and 76% of those in homes with annual incomes over $75,000 say they did this in the prior year. These figures are well above the 66% result for all Americans ages 16 and older who used a library in the past 12 months. African Americans (50%) and Hispanics (58%) are somewhat less ardent book borrowers. Getting help from a librarian, by contrast, is something for which the library users with lower household incomes and African Americans are more likely to do. Some 52% of African Americans and 49% of those in homes with annual incomes below $30,000 have done this, compared with 42% of the general library-user population. Report Extract: “Librar ies have been in flux since the dawn of the digital age. They face changes in the materials they provide, in use of their services, in the composition of their patron populations, and in demands for new services. It is a set of disruptions as far-reaching and disorienting as the changes that are occurring in the news media as the nature of news is redefined and its distribution mechanisms are revolutionized. Nearly half (48%) of Americans visited libraries in the past year. Roughly a third (32%) say they have used libraries at one time or another, though not in the past 12 months. Additionally, one-in-five (19%) say they have never visited a public library or a bookmobile. This has been a persistent trend in Pew Research Center surveys for five years, and we consistently see patterns in who these non-users are and how their views about libraries differ from more recent library users. This report was made possible by The Pew Charitable Trusts, which received support for the project through a grant from the Bill & Melinda Gates Foundation.Pew Research Center is a nonprofit, tax-exempt 501(c)(3) organization and a subsidiary of The Pew Charitable Trusts, its primary funder. The Internet & American Life Project of the Pew Research Center has produced a series of reports presenting new research on library services, trends in reading habits and patron needs in the digital age. This three-year research program is funded by the Bill & Melinda Gates Foundation and informed by an advisory group, focus groups and surveys of library users, non-users, and librarians. Extract: Overall, 91% of Americans either have ever used a public library or said another household member uses a public library.4 We asked these respondents who have personal or family experiences with libraries a series of questions about how important they consider various library services, including various library resources and activities. There are notable patterns in many of the answers about the importance of library services among those who have personal or family experiences with public libraries. In general, women, African-Americans and Hispanics, adults who live in lower-income households, and adults with lower levels of educational attainment are more likely than other groups to say these services are “very important.” Those ages 30-64 are more likely than younger or older respondents to say many of the services are “very important,” as are parents with minor children. Urban residents with library experiences are more likely than rural residents to say some services are “very important” to them. Adults 65 and older are the age group most likely to say that none of these library services are very important to them, and generally rate most services as less important overall. For instance, among those ages 65 and older with some public library experience,65% say that having a quiet and safe place to spend time at the library is important to them and their families overall, compared with 75% of all respondents who say this is important. Even in cases where a majority or plurality of seniors say the services are important to them, their level of enthusiasm is considerably lower than younger Americans. For example, senior citizens with library experience by a 72%-26% margin say that access to free books and media is important to them – a 46-point spread. On the other hand, those ages 30-49 say such access is important by an 85%-14% margin – a 71-point gap. Excerpt: “The goals of this national policy agenda are to change the conversation about libraries—from a n ostalgic character in our history to an essential player in our nation’s story—and to help focus and guide the library community’s collective outreach to key decision makers and influencers. Our strategic approach is to focus on the high-level “Library” story rather than on the silos of academic, school, public, government, and special or other libraries. We do so to create more holistic policy solutions and harness the power of our diverse community. Moreover, many decision makers and influencers do not understand or care about our silos—rather, the brand is “library” insofar as a brand exists. Libraries serve communities in diverse and interdisciplinary ways through essential services. Several of these essential service areas intersect with national priorities, and provide us with a unique opportunity to influence policy. These areas include: education and learning; employment and entrepreneurship; health and wellness; access to government information and services; and preservation of the nation’s digital heritage and history. If you have questions about the Agenda, contact the Co-principal Investigators Alan S. Inouye (ainouye@alawash.org) and Larra Clark (lclark@alawash.org) at the American Library Association, Office for Information Technology Policy, Washington, D.C. Extract: “In the 21st century, libraries of all types are responding to the changing social, economic, and political impacts of living in a digital society. Academic, school, and public libraries provide services that empower people for change. Library workers’ expertise, combined with dynamic collections and digital resources, help individuals develop new skills, communicate with others through new technologies, and help make their communities better places to live. Our 9,082 public libraries play a vital role in such community services as early childhood literacy, computer training, and workforce development. In addition, they provide a safe place for everyone, reflecting and serving the diversity of their communities in their collections, programs, and services. The thousands of public libraries in towns and neighborhoods across the United States invite community conversations and actions that further understanding and address local needs. Budd, J. (2001). Knowledge and knowing in library and information science: a philosophical framework. Lanham, Md: Scarecrow Press. Cossette, A. (1976/2009). Humanism and libraries: An essay on the philosophy of librarianship. Translated by Rory Litwin. Duluth, Minn.: Library Juice Press. Gorman, M. (2000). Our enduring values. Chicago: American Library Association. Hjørland, B. (Ed.). (2005). Library and information science and the philosophy of science [special issue]. Journal of Documentation, 61(1). Nitecki, J. Z. (1979). Metaphors of librarianship: A suggestion for a metaphysical model. Journal of Library History, 14(1), 21-42. Recommended by Ken Herold. From Sense and Reference: A Philosophical Library Blog by Lane Alan Wilkinson is Director of Instruction at the University of Tennessee at Chattanooga Library. PEOPLE. The public library is a hub of civic engagement, fostering new relationships and strengthening the human capital of the community. Librarians are actively engaged in the community. They connect individuals to a vast array of local and national resources and serve as neutral conveners to foster civic health. They facilitate learning and creation for children and adults alike. PLACE. The public library is a welcoming space for a wide range of purposes—reading, communicating, learning, playing, meeting and getting business done. Its design recognizes that people are not merely consumers of content but creators and citizens as well. Its physical presence provides an anchor for economic development and neighborhood revitalization, and helps to strengthen social bonds and community identity. The library is also a virtual space where individuals can gain access to information, resources and all the rich experiences the library offers. In the creative design of its physical and virtual spaces the public library defines what makes a great public space. PLATFORM. The public library is user-centered. It provides opportunities for individuals and the community to gain access to a variety of tools and resources with which to discover and create new knowledge. The platform enables the curation and sharing of the community’s knowledge and innovation. A great library platform is a “third place” —an interactive entity that can facilitate many people operating individually and in groups—and supports the learning and civic needs of the community. It encompasses a variety of perspectives to the journal and draws contributions not just from those working in the field of library and information science. Submissions are sought from researchers, practitioners, community members, or others dedicated to furthering the discussion, promoting research, and helping to re-envision tax policy and public policy on the extremely local level. The Political Librarian team is grateful for the generous contributions of the Washington University Libraries for hosting the journal and providing every-ready support. The International City/County Management Association (ICMA), in partnership with the Aspen Institute Dialogue on Public Libraries and the Public Library Association (PLA), conducted a nationwide survey in the spring of 2016 focused on the evolving role of public libraries in advancing community goals. The survey was returned by 1,927 chief administrative offices of local governments. This effort was undertaken to better understand how public libraries can be leveraged to advance community goals and how government agencies can partner with library leaders to better engage, inform, and empower residents. The survey was conducted in follow-up to ICMA’s 2010 Public Library Initiative Survey. • Public Service and Civic Engagement: Some 39% of all respondents said libraries should definitely provide a forum for convening public discussions. For respondents living in places with 100,000 or more people, 60% said this. Fewer (24%) said libraries should support the provision of public health services, but 33% in large population areas (100,000+) said this. • Education: Clear majorities said libraries should definitely coordinate with local schools to provide resources for kids and provide online learning experiences, with 73% and 57% saying this, respectively. For coordinating with local schools, 81% of respondents living in places with more than 100,000 people cited this as a definite priority and 85% of those living in places between 25,000 and 50,000 in population. For online learning, 70% from large population centers (100,000+) say this. Additionally, half (50%) said libraries should definitely provide “makerspace” tools for community members, with places with larger populations (100,000+) and those from the mid-Atlantic region more likely to say this (63% and 64%), respectively. • Workforce Development: Respondents see workforce development as less of a definite priority than some other areas. Some 32% say libraries should definitely provide training, technology, and resources for job-related skills. And 31% say libraries should coordinate with local employers for matching residents to employers’ needs. Respondents from larger communities (100,000+) were, by 15 and 13 point margins, more likely to cite those items as definite priorities. • Economic Development: In the economic development realm, relatively few said libraries should definitely wade into this area. Some 22% said libraries should definitely provide information on how to start a business, though nearly twice of respondents (40%) who live in areas with more than 100,000 people said this. A similar number (23%) said libraries should definitely provide a workspace for mobile workers or entrepreneurs, though 32% of those in large (100,000+) areas said this. Develo pment and Access to Information (DA2I) is the first of a series of annual reports that will monitor the progress countries are making towards fulfilling their commitment to promote meaningful access to information as part of the United Nations Sustainable Development Goals. • It explains the mission of libraries in terms that policy-makers can understand, from the United Nations to the smallest village. • It makes it clear that Internet access alone, while important, is not enough. • It sets out the argument for a properly supported library system. • It is a tool – a weapon even – for the whole united library field, a powerful statement of why libraries are motors for change. Researcher Eric Almquist and colleagues have identified “The 30 Things Customers Really Value” covering most fundamental human needs. These 30 “elements of value” are fundamental attributes in their most essential and discrete forms. They fall into four categories: functional, emotional, life changing, social impact. 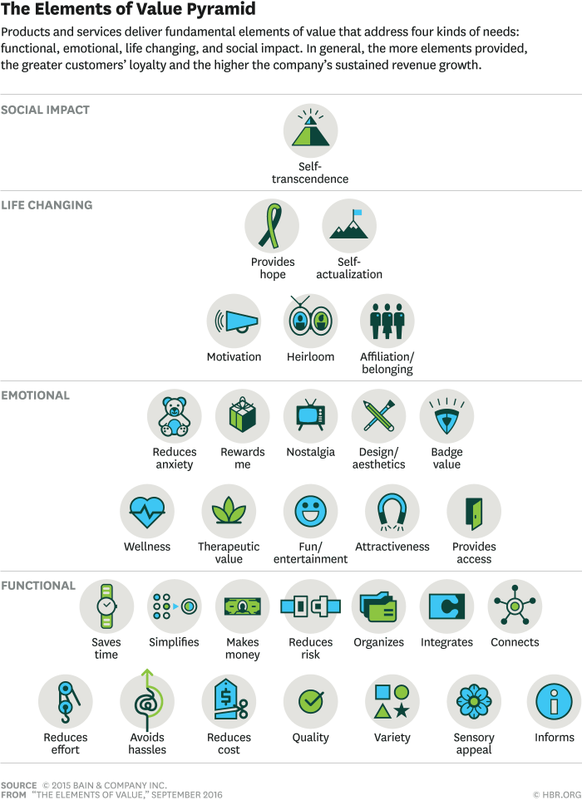 “At the base of the value pyramid is functional value. These are fairly basic services such as save people time, simplify things for them or facilitate their organization (think the Container Store). The next highest order value is emotion. When a company like CVS offers wellness services or Disney offer fun experiences it appeals to our sense of emotional well being. When community members express affection for their library (e.g. “I love my library”) that signals an emotional connection. Engaging community members in ways that connect them to our libraries emotionally provides a unique value element. Beyond emotion lies life changing value. Educational organizations offer the value of acquiring new skills or abilities that can lead to life changing opportunity. Offering a community to which members can belong is valued by those who with to be a part of something bigger then themselves – and it can be life changing. A library literacy program volunteer achieves life changing value by contributing to an organization that does change lives and improves the quality of the community. Steven Bell is currently Associate University Librarian for Research and Instructional Services at Temple University, and was previously Director of the Library at Philadelphia University. Atlas Obscura is the definitive guide to the world’s wondrous and curious places. International Federation of Library Associations (IFLA)coordinates the Dynamic Coalition on Public Access in Libraries with Electronic Information for Libraries (EIFL). IFLA is the leading international body representing the interests of library and information services and their users. It is the global voice of the library and information profession. Figuring out your public service return on investment is a great way to tell the story about how valuable your library is to the community. Click here to download the customized excel spreadsheet, or here. Since 2005, Communication Services has worked with dozens of libraries to help them achieve financial stability and sustainability. Now that libraries must live within a 2% Tax Cap World, it is more important than ever for libraries to make sure they are seen as an essential community services that deserve funding because of the important programs and services they provide.